Kilmallie’s Michael Rodger is closed down by Neil MacVicar (Kyles). Kilmallie v Kyles Athletic in the 3rd round (quarter finals) of the Tulloch Homes Camanachd Cup, played at Canal Park, Caol, Fort William. Kilmallie join Kingussie, Lovat and either Kinlochshiel or Newtonmore in the Tulloch Homes Camanachd Cup semi-finals, Newtonmore go top of the Marine Harvest Premiership on goal difference and the Kingussie and Newtonmore second teams will meet in the Aberdein Considine Sutherland Cup Final following the shinty action on Saturday July 7. 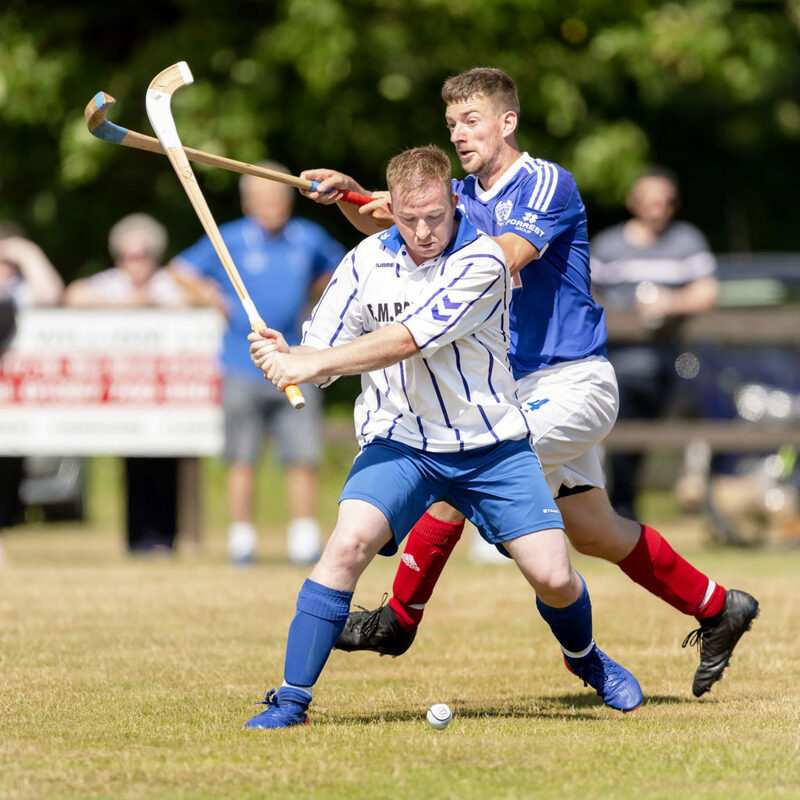 Kilmallie pulled off the shock of the Tulloch Homes Camanachd Cup quarter-finals when they beat Kyles Athletic 2-1 at a baking hot Canal Parks. Kilmallie, playing in their change white tops, got off to a great start with Calum MacDougall giving them the lead on three minutes. The ball was played by Jordan MacPhee on the left wing to Liam MacDonald who shrugged off Donald Irvine before hitting a speculative lob into the ‘D’. Kyles didn’t deal with the danger and MacDougall was quickly in to turn the ball home. Kilmallie almost added a second when Michael Rodger got past his marker and set up Liam MacDonald, but his 20-yard shot went narrowly past the keeper’s left post. Michael Rodger again hit a good ball through to Daniel Stewart but he didn’t catch the ball as he’d have liked and it went wide of target. Calum MacDougall was showing from early on he would be a handful and, on 23 minutes, he ran from 30 yards on the Kilmallie left, going past two defenders, but his shot from 10 yards hit the side-netting. It was 27 minutes into the game before Kyles threatened the Kilmallie goal. A good ball from Grant Irvine into the heart of the Kilmallie defence wasn’t cleared and found its way through to Scott MacDonald on the right and his shot went narrowly by the keeper’s right post. Kilmallie doubled their lead on 40 minutes. Robbie MacFadyen sent a good clearance out of defence which found Liam MacDonald on the right. MacDonald turned Donald Irvine before sending a 30-yard shot screaming goalwards. The ball took a deflection off Thomas Whyte, taking it past his brother John Whyte in the Kyles goal. Kilmallie almost added a third when Michael Rodger turned Neil MacVicar and picked out Calum MacDougall 15 yards out who rocketed the ball goalwards, but John Whyte made a miraculous save. Kyles went close on 53 minutes when Innes MacDonald sent in a long, looping ball from the left. The ball came to Colin MacDonald around 20 yards from goal and his goal-bound shot was deflected away for a corner by veteran Kilmallie full back Iain Robertson. Michael Rodger and Neil MacVicar were having a good battle and, on 67 minutes, Rodger took the ball down and turned MacVicar and made for goal. However MacVicar chopped him down and was booked for a reckless swing by referee John Angus Gillies. Kyles Athletic pulled a goal back 15 minutes from time when Grant Irvine found space and sent an inch-perfect pass to Sandy MacKenzie who unleashed a great shot from 15 yards out on the left with the ball nestling inside the keeper’s right post. The final 15 minutes was very tense and it took a good Kevin Toye save to deny Grant Irvine late in the tie. Over the 90 minutes, Kilmallie deserved to go through to the semi-finals and they displayed determination and dominance in most areas of the field. Speaking after the match, Kilmallie manager Mark MacPherson said: ‘We are in a good place just now and no team should under estimate Kilmallie, especially at The Canal Parks. ‘The game wasn’t pretty at times but our recent games against Kyles have been close so I knew we had a chance. I asked the players to play the old Kilmallie way and get in their faces to make it as uncomfortable for Kyles as possible. Lovat earned a place in Monday’s Tulloch Homes Camanachd Cup semi-final draw after they beat Bute 7-0 at The Meadows. There was a minute’s silence ahead of throw-up as the island of Bute tried to come to terms with the tragic loss of six-year-old Alesha MacPhail. This tie was always going to be a test for Bute who play two divisions below in South 1. Lovat’s Greg Matheson broke the deadlock on seven minutes when he was first to a re-bound off the keeper and slipped the ball into the bottom corner of the net. Graeme MacMillan added a second on 14 minutes with a good forehand strike into the top corner of the goal from 15 yards. Marc MacLachlan made it 3-0 a minute later when he beat a couple of defenders before rolling the ball past the onrushing goalkeeper. Greg Matheson got his second from the penalty spot on the half hour mark. Bailey MacKay had made a great run from wing centre and, as he was about to shoot from inside the D, he was wiped out and referee David Mitchell pointed to the spot. Matheson sent the spot-hit into the top left corner of the net. Marc MacLachlan got his second five minutes before the interval when his shot from the right deflected off the full back with the keeper going the other way. Marc MacLachlan completed his hat-trick on 85 minutes when he got clear of the full back to go one-on-one with the keeper and played a low shot into the net. MacLachlan notched his fourth a minute later. Bute were penalised for a handball and Greg Matheson was alert, taking a quick free-hit before the Bute defence had the chance to re-group. Matheson played the free hit to MacLachlan in acres of space and produced a nice first-time finish across the goalkeeper into the far corner of the goal to make it 7-0. Kingussie also reached the last four, beating Fort William 3-0 at An Aird. There were just three first half minutes remaining when Kingussie’s Fraser Munro sent a re-bound past the keeper following Lee Bain’s initial shot. This all came after a good run from Roddy Young who got past his marker before slipping the ball to Bain for his strike at goal which the keeper saved. Ruaridh Anderson made it 2-0 10 minutes into the second half. Anderson took the ball past his marker and ran towards goal before playing a one-two with full forward James Hutchison then striking the ball over the keeper’s head from just outside the box. Ruaridh Anderson got his second and Kingussie’s third in the final minute. James Falconer battled for possession and the ball fell for Anderson around the penalty area and he hit a low shot which went in off the post. Fort William’s Ruaraidh Shaw closes in on Kingussie’s Ryan MacWilliam during last Saturday’s Camanachd Cup quarter-final. The match between Newtonmore and Lochaber at The Eilan was brought forward to Friday July 6 at Lochaber’s request. Newtonmore ran out 7-2 winners in this 7pm throw-up and the win takes them to top of the Marine Harvest Premiership on goal difference. A ferocious Neil Stewart back-hand effort was saved with his chest by Lochaber keeper Alistair MacDonald on four minutes. Newtonmore broke forward to score the game’s opening goal on 18 minutes. A good passing move stretched the Lochaber defence as Evan Menzies found Glen MacKintosh who played the ball wide to Michael Russell on the left. MacKintosh continued his run forward and allowed Russell’s low return ball to run across him before driving it across keeper Alistair MacDonald into the far corner of the net, beating the goalie on his right side. Goalie MacDonald saved well with his stick from Jamie Robinson on 25 minutes. The hosts added a second on 31 minutes. Lochaber defender James MacRae missed a Neil Stewart ball from the right and Evan Menzies forced his way in past the keeper to score. Lochaber pulled a goal back on 61 minutes. The home defence struggled to clear a long ball forward from Martin Johnstone and when keeper Kenny Ross tried to clear from the left of the ‘D’, the ball came off Rory Kennedy’s legs and spun across goal where Stuart Callison knocked it into the unguarded goal. Newtonmore weren’t going to let this one slip though and Ewen Fraser made it 3-1 eight minutes later. A shy from the Newtonmore right came into the danger area. Keeper MacDonald tried to clear the ball but Glen MacKintosh, on the Newtonmore left, got in his way and the ball deflected across goal for Fraser to net from close range. Straight from the re-start, Drew MacDonald played a ball from midfield down the Newtonmore right. Evan Menzies showed more desire to get to the ball and crossed for Jamie Robinson who was running in at the back post and he lofted the ball home to make it 4-1 with 70 minutes played. Shaun Nicolson was playing well at full centre for Lochaber but Newtonmore took a grip of the wing centre positions with Jamie Robinson, David MacLean and his replacement Drew MacDonald, playing very well. Newtonmore added another on 76 minutes. Jamie Robinson sent in a shy from the left and Glen MacKintosh gathered the ball before Michael Russell took over and fired home from wide on the right. Evan Menzies got his second a couple of minutes later. Menzies ran onto a short Jamie Robinson corner from the left and turned quickly before sending a powerful shot across the keeper. Lochaber pulled another goal back when a ball was deflected into Stuart Callison’s path and he made it 6-2 from the edge of the ‘D’ with 11 minutes remaining. Glen MacKintosh got his second in the final minute. The Lochaber defence failed to clear MacKintosh’s ball from the left and when the ball came back out to the Scotland forward, he drove it across the keeper to make it 7-2. Oban Camanachd followed up the previous week’s Scottish Sea Farms Glasgow Celtic Society Cup win with a hard-fought 2-1 victory over Skye Camanachd at Pairc nan Laoch. Skye manager John MacLeod made just one change to the side which drew with Kinlochshiel a fortnight earlier as Will Cowie took over from the holidaying Iain MacLellan in attack. Kenny Campbell was also back, but started on the bench with Allan MacLeod. Iain Nicolson remained out, joining Steven Morrison, Ally MacDonald and Iain Murray on the absent list. Oban Camanachd manager Ian Hay was without Andrew MacCuish, Aidan MacIntyre, Malcolm Clark and Daniel MacVicar who all started the Celtic Society Final. Daniel MacCuish, Matt Rippon, Keith MacMillan and Craig MacDougall, who were all on the bench the previous week, were also missing. Evan MacLellan and Lewis Buchanan were in the starting line-up with Stephen Sloss an unused substitute. Oban started well and Willie Neilson, who was very lively in attack during the first 45 minutes, saw a shot saved with his legs by Skye keeper Iain Macleod. Skye came more into it and Oban goalie Cameron Sutherland also made a save with his legs to deny Ruaraidh MacLeod. Oban Camanachd took the lead on 32 minutes. The Skye defence failed to clear a ball on the Oban left and Daniel Cameron showed persistence to score. The visitors doubled their advantage three minutes later. Lewis Buchanan ran deep from his full forward position and his turn and shot from 30 yards was saved by Iain MacLeod but the ball bounced on the hard surface and Willie Neilson was quickly in to loft the re-bound into the roof of the net. Cameron Sutherland made a great save with his right foot to keep out a Ruaraidh MacLeod effort just before the break. Oban Camanachd knew a third goal would see Skye off but it was the islanders who halved the deficit 20 seconds into the second half when Ruaraidh Macleod’s back-hand strike beat the keeper on his left side. Skye went for a leveller and a quick free-hit was played to Ruaraidh MacLeod on 53 minutes, but keeper Sutherland made a great save with his feet and Will Cowie sent the re-bound over the top from a tight angle. With 15 minutes remaining, Ruaraidh MacLeod darted in from the left to get on a Martin Pringle pass. MacLeod did well to take the ball wide of the keeper but steered it just the wrong side of the goalie’s right post from a tight angle. Skye claimed for a penalty a couple of minutes later when Chrissy MacMillan did well, using his feet to keep out a Ruaraidh MacLeod effort on the goal line but referee Calum Girvan waved away their claims after consulting with the goal judge. Lewis Buchanan played a one-two with Oban Camanachd substitute Ross Campbell moments later but Buchanan’s shot went narrowly by the keeper’s right post. Oban Camanachd, with Scott MacMillan working tirelessly at full centre, brought Daniel Cameron back into defence to protect their lead for the final 10 minutes, with Chrissy MacMillan going forward. 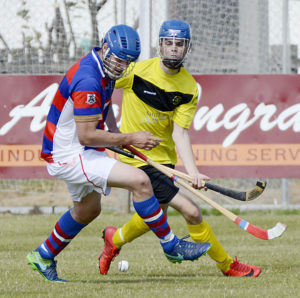 Oban Camanachd saw out the remaining stages and, in what was a classic game of two halves, they did just enough to win the game. Speaking straight after the final whistle, Oban Camanachd manager Ian Hay was happy with the win. ‘I thought we had the better of the first half and we got our two goals. But to be fair to Skye, they scored early in the second half and we were up against it for the whole of the second half but well done to the boys for digging in and holding on. ‘We were without ten senior players from last week but the boys who came in from Lochside did well and will be looking for more appearances. Caberfeidh took the lead with a great goal on 11 minutes. A quick free-hit found Kevin Bartlett in space on the left and he had time to stop the ball and look up before blasting goalwards from a very tight angle. Keeper Stuart MacKintosh got his stick to the ball but such was the force of the shot that the ball deflected into the roof of the net. Liam Symonds made it 2-0 on 17 minutes when he got onto a ball from the left and his shot from the right of the penalty spot skidded off the surface, going through the keeper’s legs. Glenurquhart brought James MacPherson on for Finlay Robertson a couple of minutes later. Fraser Heath opened Glenurquhart’s account with a shot from the right on 26 minutes but Caberfeidh went on to score twice more before the break. Glenurquhart’s Lachie Smith was penalised for a kick on 31 minutes when the ball came off his leg. The free hit was played out to the wing before it came back to Craig Morrison who sent a fierce shot past an unsighted keeper from around the penalty spot to make it 3-1. There was good movement in the Caberfeidh forward line and Colin MacLennan made it 4-1 on 38 minutes. Kevin Bartlett created the goal as he juggled the ball forward as he cut into the danger area. Bartlett continued to show great skill as he flicked the ball over his shoulder to Colin MacLennan who scored on his back-hand from outside the ‘D’. Caberfeidh brought Calum Mac-Kinnon on for an injured Scott MacPhail. The pace of the game dropped in the second half with the heat perhaps taking its toll. Connor Golabek was unlucky not to score when he flicked a ball past the keeper but it took an awkward bounce and ran away from him. Stuart MacKintosh saved well from Colin MacLennan before Fraser Heath got his second with three minutes remaining, his low bouncing shot going in off the outside of keeper Ewen Pilcher’s right leg. Connor Golabek was best for Glenurquhart with Kevin Bartlett very effective for Caberfeidh. Jamie Matheson worked hard on his return to the Caberfeidh attack whilst Jack Picher, an excellent blocker, and full back Blair Morrison, also caught the eye. Inveraray go third in the league after they beat Oban Celtic 6-3 at The Winterton. Allan MacDonald, a Fraser Watt hat-trick, young Ruaraidh Graham and Craig Taylor all counted for Inveraray. Connor Howe and Ross MacMillan twice replied for Oban Celtic who turned in a poor performance overall. 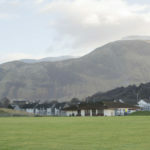 It is going to be a busy week for Oban Celtic manager Kenny Wotherspoon who has arranged a friendly match for the South U21 squad against Oban Camanachd at Taynuilt Playing Field on Tuesday July 10 and he begins to cut the squad down prior to the Caol Cup clash against the North U21 on Saturday September 1. There will be another friendly match in mid-August. Strathglass made it seven from the last eight league points after beating Beauly 2-0 at Cannich. This was a good performance from the hosts in the scorching heat and they deserved the win. Strathglass always looked dangerous up front. Seventeen-year-old Colin Birnie opened the scoring on 25 minutes with a 35-yard drive from close to the touchline which flew high into net. Ally MacAdams added a second on 31 minutes with a 20-yard piledriver, giving Josh Grant in Beauly goal no chance. Josh Fraser, Donald Fraser, George Phimister and Jono Price were superb in the Strathglass defence, keeping Beauly danger men Jack MacDonald and Sean Stewart well shackled. Adam Todd in the Strathglass goal had very few saves to make. This was a final home match of the season for Strathglass, with their remaining fixtures on the road against Glasgow Mid Argyll, Inveraray, Oban Celtic and Fort William. The Kingussie reserves beat the Skye Camanachd reserves 4-1 at Castle Leod. Skye came close to taking an early lead, before Ryan Borthwick got the opener for Kingussie on 11 minutes. Skye’s Sam MacPhee sent a shot inches over the top from a Ross Gordon cut-back before Gordon later hit the side-netting. Russell Menzies scored a crucial second Kingussie goal on the stroke of half-time which was a blow to Skye’s chances. Ryan Borthwick struck a terrific second goal past a helpless Ryan Morrison on 51 minutes. Angie MacDonald gave Skye a glimmer of hope when he pulled a goal back on 58 minutes and, a minute later, Ross Gordon looked destined to score but his effort went wide. Kingussie full forward Ryan Borthwick completed his hat-trick on 79 minutes to seal a final spot. Kingussie’s Rory Fraser ran the show in the middle of the park, with Borthwick’s treble making the difference as Kingussie took their chances where Skye failed to take their opportunities. The Newtonmore reserves came from a goal down to beat the Fort William reserves 5-1 in their semi-final at Spean Bridge. Newtonmore went into the match three players short so manager Orsten Gardiner and his assistant Mark MacDonald were substitutes, pushing the average age of the squad from 18 to 21 years. Fort William went in front on eight minutes with Mark Fraser scoring. The goal came from a corner which was missed by three Newtonmore defenders but Fraser made no mistake. Newtonmore, with wind advantage, created a number of chances and levelled courtesy of a Craig MacLeod rocket-shot on 18 minutes. Paul MacArthur added two more with composed finishes on 27 and 40 minutes to make it 3-1. With the game finally poised, Newtonmore keeper Calum Grover made a superb save, tipping a deflected shot over the bar. The save came a minute before the break and was a big moment in the tie with half-time fast approaching. Fort William, with Mark Fraser looking dangerous, had the wind advantage in the second half but as they attacked, Newtonmore relied on Iain Richardson’s big hitting and Stuart Mitchell’s outstanding defending to clear everything that went past the centreline. Owen Fraser was winning everything in the middle of the pitch and, with Tommy Stewart and Duncan Gorman doing well on either side, Newtonmore took control of the game. Calum Stewart had seen a number of shots saved but he blasted the ball home to make it 4-1 on 58 minutes, giving Newtonmore a cushion. Somhairle Thomson added a fifth on 77 minutes, although the ball appeared to go into the net off a Fort William player. The game was played in hot conditions and referee Des McNulty pretty much kept a lid on proceedings, but it got a bit tousy at times. The win sets up a Badenoch reserve team derby as Newtonmore and Kingussie meet in the final. Aberdeen University came from two goals down to draw 2-2 with the Kinlochshiel second team in their 2pm throw-up at a very hot Balgownie. Kinlochshiel, playing with the wind, had much of the early play before Shaun Peterkin scored on 21 minutes to give them the lead. The visitors hit the post before Fraser Reid closed down the keeper as he tried to clear to add a second on the stroke of half-time. The students had the elements in the second half and were on top when Donnie MacRae grabbed a goal on the hour to make it 2-1. Ross MacMillan had a fine game at the back for Kinlochshiel as they soaked up Aberdeen pressure. Kinlochshiel also had chances to put the outcome beyond doubt, but it remained 2-1 until a minute from time when Alex Duncan equalised for the Aberdeen side. Lochside Rovers surrendered a two goal lead before finally seeing off Col Glen 4-2 at Mossfield. Aidan MacIntyre and Daniel MacCuish were both unable to travel to Portree with the Oban Camanachd squad so they turned out for Lochside, as did Keith MacMillan who arrived from work early in the match. Col Glen created the game’s first real chance on three minutes as Jamie MacVicar ran to the near post to get onto a ball from the right, but his strike hit the side-netting. Ronnie MacVicar in the Col Glen goal then saved well from Aidan MacIntyre’s low 20-yard shot and Lennon Campbell pushed the rebound wide. Lochside went in front on 31 minutes. The ball was played forward to Aidan MacIntyre with his back to goal. MacIntyre sent a neat reverse flick to Daniel MacCuish who fired a 18-yard shot low into the net. Aidan MacIntyre turned scorer a couple of minutes later. MacIntyre forged a strong run forward, holding off a couple of challenges, and with referee John Matheson playing advantage, he drew keeper MacVicar before slipping the ball come. With five first half minutes remaining, a strong Daniel MacCuish run ended when he was impeded inside the ‘D’. The referee pointed to the penalty spot and although Daniel MacCuish struck the ball well enough, it went straight down the middle and was saved with his stick by Ronnie MacVicar. From looking in control, Lochside lost two goals in three minutes with Sandy Paterson on the hour mark and Ewan Kennedy three minutes later punishing the Oban side for not clearing their lines. Keeper Dougie MacDonald had no chance with either strike. Lennon Campbell put Lochside back in front on 76 minutes when he was quickest to react in front of goal, set up by Michael MacQueen who had by this time been pushed forward. MacQueen was again the provider as Aidan MacIntyre got his second from close in on 83 minutes. Keeper Dougie MacDonald, Scott Robertson on the wing and Keith Burnett all did well for Gareth Evan’s side which has a run of home games to come. Lochside will play a league match against Taynuilt at Mossfield on Friday July 13. Throw-up is at 7.15pm with the match brought forward at Taynuilt’s request. The Kyles Athletic second team go three points clear at the top of the table, maintaining their title charge with a 5-1 win over Ballachulish at The Dunoon Stadium. Kyles were missing Innes MacDonald who was on first team duty, whilst Ballachulish were without Cain MacPhee following his sending off in the previous week’s defeat to Aberdour. Two goals in two minutes gave Kyles an early cushion, with Jack Whyte on 11 minutes and Ewen Mitchell a minute later making it 2-0. Jack Whyte got his second on 24 minutes to make it 3-0 at the break. Brandon Wilson added a fourth four minutes into the second half. Donald Wilson pulled a goal back on 74 minutes, only for Ewen Mitchell to get his second a couple of minutes later to round off the 5-1 win. Although Kyles have a three-point gap at the top, they still have difficult games to come against teams in the top part of the division. The noon throw-up between the Inveraray seconds and Tayforth at The Winterton was postponed as Tayforth were unable to raise a team. Tayforth have been deducted two points and the match will be re-scheduled. The match between Taynuilt and Kilmory at Taynuilt Sports Field was also postponed. Kilmory were unable to raise a team so will be deducted two points.The match will be re-scheduled. The Beauly and Inverness second teams met at Braeview Park in a re-arranged evening match on Wednesday July 4. The Beauly colts got off to a great start, with Danny Marshall giving them the lead after two minutes. Callum Flynn made it 2-0 on 15 minutes before Beauly U17 player Euan MacCormick took centre stage. MacCormick grabbed a first half hat-trick with goals on 23, 25 and 43 minutes to make it 5-0 at the break. Euan MacCormick took his tally to four goals with a strike on 57 minutes. Peter Dickson rounded off the 6-0 win with a goal in the final minute. The Lovat seconds stay top of the division after beating Boleskine 4-0 at Balgate. Raymond Rennie gave Lovat the lead on 13 minutes and he must be catching the eye of first team manager Fraser Gallacher as he added a second on 27 minutes. Cameron MacMillan made it 3-0 on the stroke of half-time. Raymond Rennie completed his hat-trick on 75 minutes. Russell Ross made a return to refereeing to officiate in the game. The Caberfeidh reserves came from a goal down to beat Lochcarron 2-1 at Battery Park. Peter MacKenzie gave Lochcarron the lead on 23 minutes. The impressive Liam Arnott broke forward and went through one-on-one with Caberfeidh keeper Iain McCall who saved well at the expense of a corner. The resultant corner wasn’t cleared by the Caberfeidh defence and Peter MacKenzie took advantage to score. Caberfeidh lost full back Andrew MacMaster through a hamstring injury so Alan Ross went from full forward to defence as part of the resultant shake-up. Caberfeidh took time to re-adjust but Ruairidh MacLeman’s goal on 31 minutes, following a quick passing move which cut open the home defence, made it 1-1 at half time. The hosts had the chance to go in front from the penalty spot following an infringement inside the ‘D’. But substitute Kenny Murray, who had just come on and had yet to touch the ball, saw his spot-hit saved with his feet by keeper Iain McCall who then cleared the ball up-field. Caberfeidh substitute Kai Macaulay gathered possession before finding David Mellis who sent a terrific shot from distance into the top corner of the net to make it 2-1 with 72 minutes played. In seconds, Caberfeidh had survived the threat of falling behind to grabbing what proved to be the winner. The victory means Caberfeidh leap-frog Lochcarron into second place in the table on goal difference. They trail leaders Lovat by three points but have two games in hand on Lovat and Lochcarron. The match marked a welcome return to refereeing by former Camanachd Association director Callum Duff. Lewis Camanachd were 5-1 winners against the Kilmallie second team at Shawbost. Lewis Camanachd took the lead on eight minutes through Ally Lamont with the goal coming from a corner. Al Reed added a second on 32 minutes, scoring straight from a shy. Scott MacLeod blasted home a great 30 yard drive a couple of minutes later to make it 3-0 at the break. Kilmallie started the second half well and Stuart Ross pulled a goal back on 63 minutes but there was to be no comeback. Donald Lamont restored the islanders’ three-goal cushion on 67 minutes and, on 78 minutes, young Callum MacRitchie scored a superb first senior competitive goal to make it 5-1. Strathglass took a grip of the game, scoring twice in two minutes with Ruairidh Strachan netting on the half-hour mark and Eddie Noble making it 2-0 on 31 minutes. The Inverness seconds and Strathspey Camanachd shared the points in a 1-1 draw at The Bught Park outside pitch. Rory MacLennan scored a first goal at this level for Inverness with Dane Taylor on target for Strathspey. Strachur top South 2 on goal difference after they beat Oban Celtic 2-1 at Strachurmore. Strachur’s Iain Wilson missed out for passing through the suspension threshold but Oban Celtic’s Scott Mossman was free of his ban. Oban Celtic led 1-0 at the break courtesy of Calum MacLeod’s goal on 30 minutes. Iain MacLennan drew Strachur level on 65 minutes and Steven Wilson notched what proved to be the winner with 10 minutes remaining. Oban Celtic’s Craig MacMillan faces a spell on the touchline after he was sent off by referee Deek Cameron. Glenorchy climb to second following their 5-1 victory over the Aberdour reserves at Mart Park. John Sartain scored the opener on 30 minutes for the hosts with what was the only goal of the first half. Conor Sartain doubled their lead a minute into the second half and got his second and Glenorchy’s third on 58 minutes. Iain Livingstone on 75 minutes and Ryan Barclay five minutes from time sealed the win. Glasgow Mid Argyll and Bute second teams agreed to re-schedule their match at Yoker. The Valerie Fraser Camanachd Cup Final between Badenoch Ladies and Skye Camanachd Ladies will be broadcast live on BBC ALBA. The final takes place at The Dell on Saturday September 1. It will be preceded by the Marine Harvest Challenge Cup Final between Inverness and Glenurquhart.